Salvaging is important – to me at least. I’ve always been conscious of thinking that way, even as a child collecting and re-arranging broken wooden pegs into artworks. Collecting began with bits of fabric, metal screws and springs, broken toys, doll parts, driftwood – anything small enough for me to carry in my own box as we moved house. The collecting idea has never gone away; the bits are now just bigger! 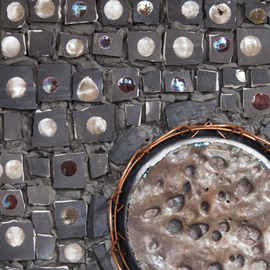 I discovered mixed media mosaic about 15 years ago after graduating through a number of other arts and crafts – furniture restoration, decoupage, oil painting, decorative painting, quilt-making, collage and acrylic painting, concrete sculpture… many of these things are about taking something discarded and turning it into something new. My teaching in schools is always focussed on the value of salvaging for art using what we have around us. I am interested in exhibiting work which speaks to the human condition – our relationships with one another, our reactions, our emotions, our lives. And how we impact and are impacted by the environment around us.